This is a great flag for the auto lover. 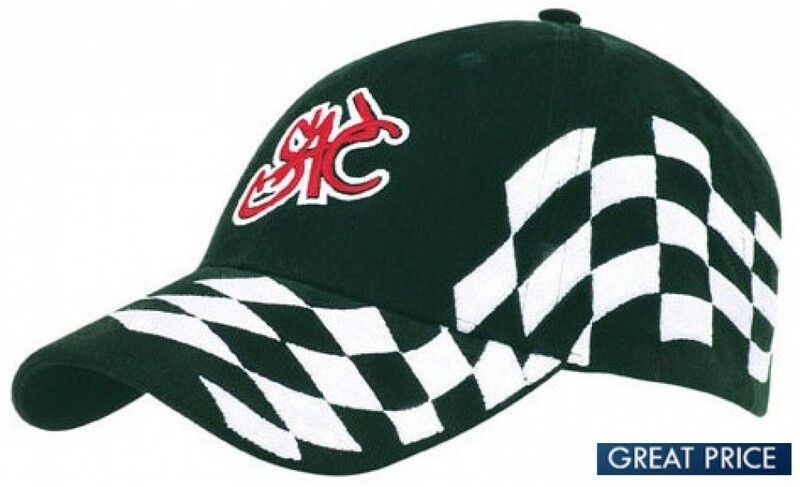 This hat boasts a waving checkered flag design that goes from the bill all the way down the one side of the hat. It is sure to get some attention even from a distance, especially racing fans that love the beauty of the black and white flag. The cap has air holes for ventilation at the top of the hat panels, to help cool things down. There is no mesh used here -- the hat features solid panels all around. It is a low profile designed hat and features a cloth strap and buckle for an adjustable fit. This cap comes in one colour combination - black and white. This is a perfect cap for racing fans -- or anyone into cars. Branded with a logo, it would be perfect for racing organisations, car supply shops, garages, and racetracks --anywhere that checkered flag is a cherished sight. These would be great hats for giveaways, sales and more. This is a great unisex hat as well, so it is a great solution for when you need a hat with a great design that works for everyone. Please, supply all branding artwork in eps, pdf or high-resolution jpeg. All products include 8000 stitch count of embroidery as standard. Other branding options also available, check out our FAQ. Listed price excludes GST and freight.